Very clean, location very good and entertainment good. Location perfect, sea and pool so close to each other, beautiful area, nice rooms, towels changed regularly, staff and others friendly, our second visit here and would consider again, despite the issues listed below. The lady at the reception everyday was amazing, so helpful, and polite and couldn’t do anymore for us. Rooms was great and excellent for the price! Chambermaid made a bed and gave us new towels every day. The reception team were extremely helpful when we arrived and the room was beautifully clean with all the amenities you’d need to cook for yourself such as a microwave, toaster and a double hob. They provide pans and a fridge and utensils which were brilliant and the little bag of goodies you get in the bathroom was so thoughtful. They literally thought of everything! Couldn’t recommend enough! The view from the pool is incredible. The atmosphere is perfect. Beautiful locaction. Comfortable beds. Lock in a great price for Globales Verdemar – rated 8.2 by recent guests! Globales Verdemar This rating is a reflection of how the property compares to the industry standard when it comes to price, facilities and services available. It's based on a self-evaluation by the property. Use this rating to help choose your stay! One of our best sellers in Santa Ponsa! 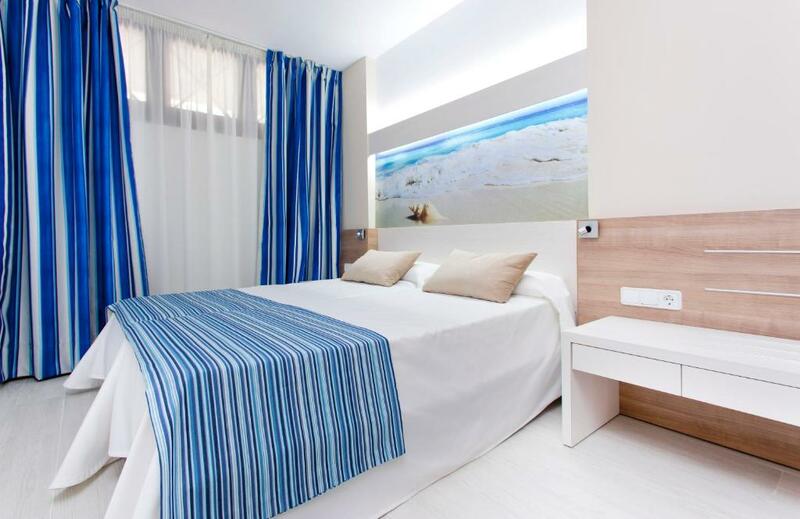 Verdemar Apartments Santa Ponsa in Majorca offers accommodations with private balconies set by the sea, as well as a fantastic outdoor pool and bar-restaurant. There is 24-hour reception. Soak up the glorious sunshine on the poolside loungers before a refreshing dip in the pool as you gaze at wonderful Mediterranean views. Cool off with a delicious cocktail from the poolside bar of Apartamentos Globales Verdemar. Take the pleasant walk down to Santa Ponsa beach which enjoys fine white sands and shallow warm waters perfect for swimming. 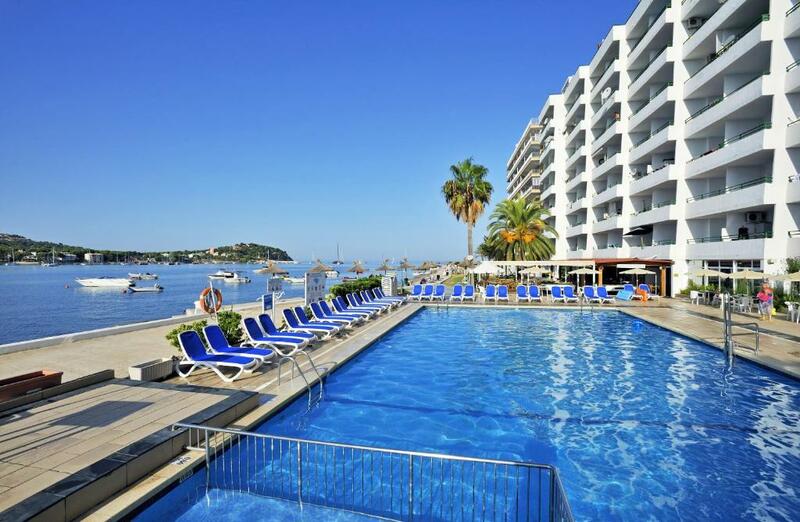 After a hearty dinner in the à la carte restaurant of Verdemar Hotel Santa Ponsa, try your luck at the nearby casino and then head out to one the resort’s stylish venues or for a dance in the nearby resorts of Magaluf or Palma Nova. There is a bus service to connecting villages of the area. When would you like to stay at Globales Verdemar? This air-conditioned studio has a balcony and a private bathroom. It comes with a satellite TV and an open-plan kitchenette. Most studios have sea views. A safe can be hired for a supplement. Hairdryer is available upon request. 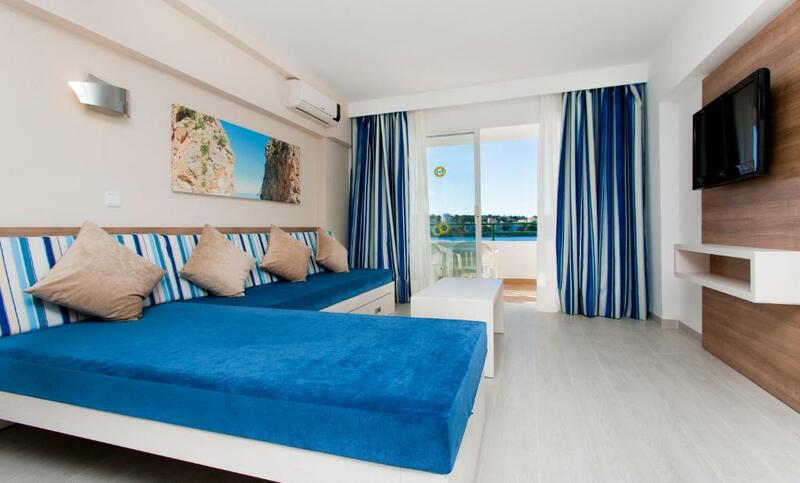 This air-conditioned studio has a balcony overlooking the sea. It comes with a private bathroom, a satellite TV and an open-plan kitchenette. A safe can be hired for a supplement. 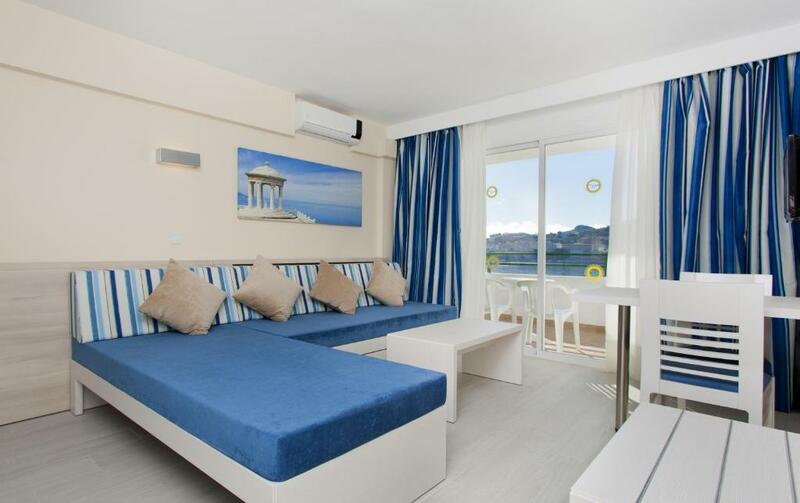 This air-conditioned apartment has a balcony overlooking the sea. It comes with a private bathroom, a satellite TV and an open-plan kitchenette. A safe can be hired for a supplement. This studio has air conditioning, electric kettle and balcony. This studio features a microwave, electric kettle and air conditioning. This studio has a kitchenware, balcony and microwave. 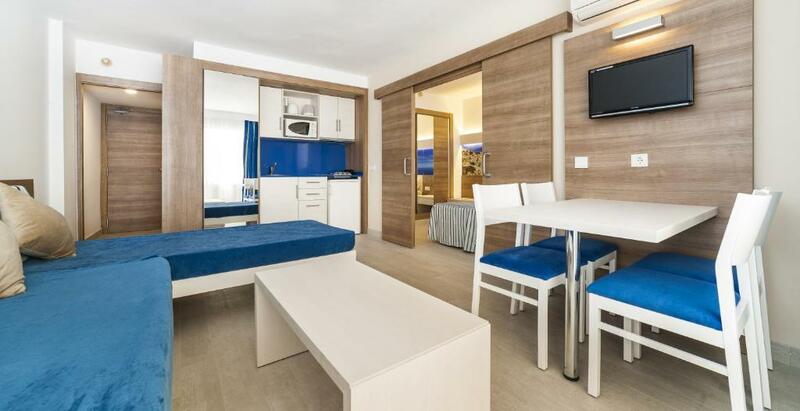 Los Apartamentos Globales Verdemar (3Ll), en Santa Ponsa (Mallorca) con su privilegiada situación al borde del mar y sus maravillosas vistas sobre la bahía de Santa Ponsa, junto a la playa, disponen de apartamentos y estudios bien equipados, la mayoría con vista al mar, con terraza, kitchenette, baño completo, etc., son ideales para parejas y familias. Los clientes pueden disfrutar durante su estancia en estos apartamentos (con una muy buena relación calidad-precio) de zonas comunes climatizadas, de amplios salones, de 1 restaurante a la carta, bar, salón TV satélite, sala de conferencias y en su amplia terraza sobre el mar, de la piscina. Nuestro equipo de animación, se ocupa de organizar las actividades nocturnas y diurnas, juegos y diferentes competiciones. Todos los estudios y apartamentos renovados desde el 2015. La zona de Santa Ponsa ofrece al huésped de los apartamentos la posibilidad de practicar deportes acuáticos, equitación, golf, tenis, etc., la vida comercial y nocturna de este importante núcleo turístico y la de los alrededores, Magalluf, Palmanova, Portals nous o Paguera. House Rules Globales Verdemar takes special requests – add in the next step! Globales Verdemar accepts these cards and reserves the right to temporarily hold an amount prior to arrival. Please note, guests can make use of 60 minutes of free WiFi per day uninterrupted. Extra WiFi is available at the following costs: EUR 6 per day, EUR 15 for 3 days and EUR 25 per week. WiFi, I think is a need, paying 6 euro’s a day for it is just silly. Also, paying for the sun bed by the pool is also ridiculous. View from the balcony was awful (wall). Internet wasn't working good. Having to pay extra 3.50 Euro each for a sunbeam in the hotel grounds . Pool not heated out if season . Charge of 1.50 euros for a cup of ice ! Seafront view . Weather. Apartment . There is no on site parking but there is a free car park literally 5 mins down the road so it’s no biggy! nice bathroom, but everything is floaing when you take a shower; just basic choice of food in restaurat and not the best; one day we couldn't rent sunbeds, because staff didn't have a key to open the locker; hotel is really loud, you can even hear what tv programm are watching people behind the wall; reception staff is friendly until you have problem. In hotel book was information about airport transfer by shuttel bus. I ask about it in reception 4 days before fligt. I get info, that transfer order is 24h before flight, but to make sure I can ask about it next day. Next day I get the same answer, and receptionist asure me that we will get this transfer. The day before fligt, they informed me, that shuttel bus is not driving in this time of the year, and I can order taxi. Reception manager was rude and didn't even try to help me with looking for some other options. The only thing I heard from her was "I said I'm sory." everything I paid a little extra for sea view but we'll worth it. it's front line and brilliant value for money. A lot... stay for yourself in one of the rooms (258) and question yourself if you would go there again. The sun beds were not included in the hotel cost. Perfectly located with the most amazing views over Santa Ponsa, excellent service, rooms were clean and spacious... don’t want to go home. Was way above our expectations, would definitely recommend, close to all amenities. We had a sea view which was amazing. Absolutely everything, the staff are so amazing and the place was so clean! !